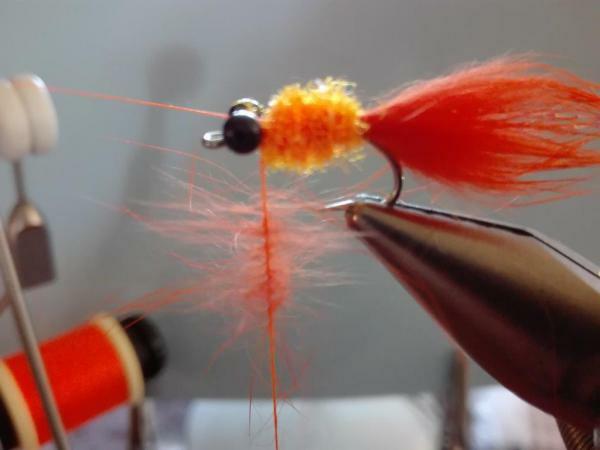 FOSAF Fly of the month – The “OO” or “Octane Orange”. 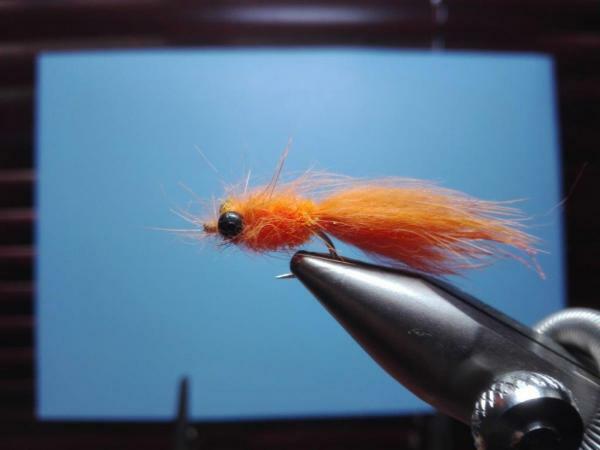 FOSAF NEWS - FOSAF Fly of the month – The “OO” or “Octane Orange”. This is a saltwater pattern for blacktail/dassie by Gary Grobler of the Port Elizabeth Fly Tyers Guild. Place hook in vise and lay a foundation of thread onto the shank up to the barb of the hook. The tail is tied in 3 stages. Stage 1 - is to cut a tuft of orange rabbit from the strip. Length roughly 1/ 1.5 times the hook shank length. This first tuft must have plenty of under fur. Stage 2 - is to catch in 2 strips of krystal flash fine to protrude not more than 1/2mm past the caught in rabbit. Stage 3 - again catch in a tuft of rabbit. This tuft must be slightly shorter than the first, less under fur and plenty of guard hairs. A general rule of thumb here is that the volume of the tail must be full and roughly equal to the gape of the hook. As with marabou, rabbit when wet condenses considerably. What you are looking for is for a short fluffy pulsating tail. Now prepare a dubbing loop with your tying thread. This will be used for the body later. Next take your thread forward and tie in the bead chain eyes. (hooks #8 & #6 small eyes, #4 & #2 medium eyes) A good tip here to secure the eyes properly is to apply super glue to the tying thread as you figure of eight the eyes in place. Once the eyes are tied in your tying thread is left hanging behind the eyes. The next step is to decide on a body using either the cactus chenille or a looped rope of orange dubbing. Wind the body forward but whatever technique is used the body must be full. Lastly the collar. Using the dubbing loop method prepare some rabbit fur. The collar must be SPARSE. Just 2 turns and tie off. A good collar marries the body to the eyes without covering the fly when wet. Last point is the easiest. Tie on some tippet and go catch some fish. Body – 3 or 5 mm orange cactus chenille. Hot orange flash dubbing as a substitute. Fish this fly on a floating line with a standard leader of 9 foot and a 10 lbs tippet section of roughly 18 inches. If fishing in deeper gullies and in the “washing machine” then crimp 2 lead split shots roughly 12 – 15 inches from the fly and fish on. Most of my blacktail fishing is however to feeding fish in very shallow water of 400mm and less. Here I shorten the leader to 7 foot with a 10 - 12 inch tippet of 8 lbs. Blacktail like grunter also tail when feeding in shallow water. In such a situation one is able to get within 15 – 20 metres away to feeding fish. 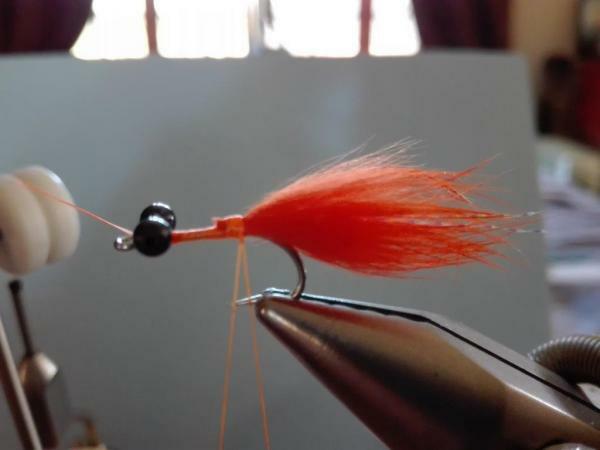 When the tails are up and the noses down, place the fly within 750 mm of tailing fish. Wait 5 seconds and start with a figure of eight retrieve. The take usually occurs within the first metre. If there is a shoal feeding then your success rate increases. 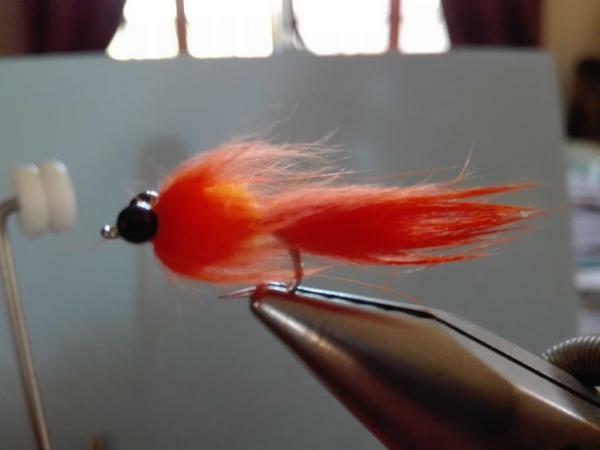 This fly is used to imitate red bait. Enjoy the tie.